New book, some self wear to cover, 192 pages. 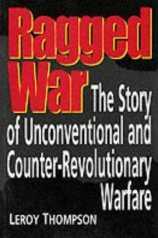 This book examines the development and origins of Guerrilla and unconventional warfare. Among the first recorded examples are the Scythians 'hit and run' tactics against the Persians and Romans, and Hannibals counter to their operations - the use of independent light infantry units - remains one of the best tactics to this day. This study reviews the most effective tactics, the importance of intelligence, the weaponry used, and analyses the training of three elite special warfare units.